Bare-root roses are commonly sold in packages and shipped around the time the roses should be planted. Planting a rose bush in a container makes it movable. The rose container is moved into a sheltered area to protect the plant from freezing weather. Container roses are a trial run for the gardener to check to see what the rose bushes look like and to see if they are vigorous growers. Remove the packaging from the rose plant with a sharp knife. Soak the bare roots in a bucket full of water for eight to 12 hours to rehydrate the roots. Trim away any damaged or diseased roots with sharp pruning shears. Prune the canes back so that only three to five buds are on the canes. Cut away any rose canes thinner than a pencil. Be sure to keep three to five canes on the rose bush. Wash a container with soapy water and rinse it with one part bleach mixed with nine parts water. Use at least a six-gallon plant pot. Mix equal parts of potting soil, compost and manure. Add one cup of perlite to improve the drainage. Add one cup of bone meal to feed the rose bush roots. Fill the container with enough soil to put the bud union level with the rim of the pot. Create a mound of soil in the middle of the container. Place the rose bush on top of the soil mound and spread the roots down the sides of the mound. Fill the container the rest of the way with soil. Leave 2 to 4 inches of space between the soil and the container rim. Firm the soil down around the rose bush. Pour water into the container until it comes out the bottom. Add 1/2 inch of peat moss in the top of the container. Mulching keeps the soil warmer and conserves soil moisture. 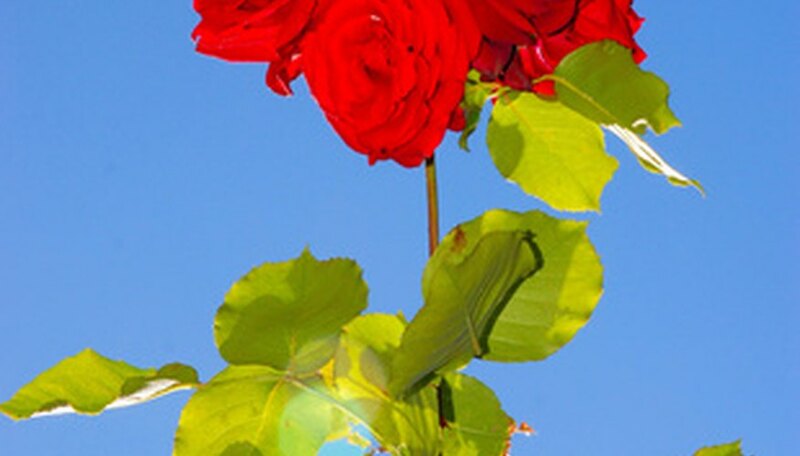 Place the rose in a site with full sun exposure. Bare-root roses may arrive too early to plant right away. Check the packing material for moisture and water lightly if it is dry. Store your bare-root rose bush in a cool, dark area. Dehydrated canes are not good for the health of the rose bush. Immerse the entire rose bush in water for a couple of hours to add moisture to the canes. University of Michigan: Why Grow Roses in Containers?